Take the B or C train to the 81st St./American Museum of Natural History station for less of a hassle. Don't drive! To see the balloons when they're closer to full form, show up around 9 p.m.
Each year, the giant balloons for the Macy's Thanksgiving Day parade come to life as parents and children marvel in amazement the night before the spectacle. 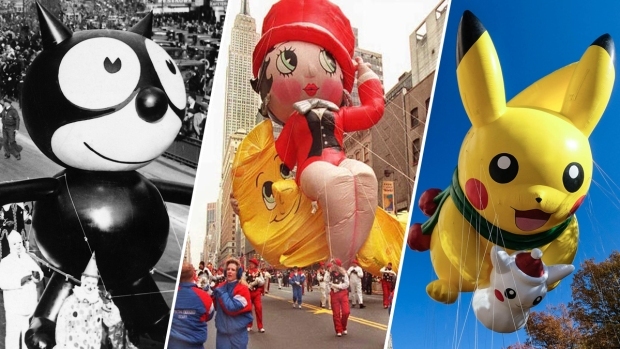 Fifty-foot versions of Grover, Charlie Brown and Mickey Mouse are pumped up with helium and held down by large nets to ensure they don't escape before a big day of festivities. Last year's inflatable guests include Hello Kitty, Angry Bird's Red and the nutty squirrel from Ice Age, Scrat. If you'd like to see how the magic happens and get a sneak peak at some of the fun balloons, head to the Upper West Side on Wednesday, Nov. 23. The hot-air characters can be viewed at 77th Street and 81st Streets between Central Park West and Columbus Avenue from 3 p.m. to 10 p.m.
To see the balloons when they're near-fully blown up, it's best to show up closer to 9 p.m.
Leave the car parked, public transportation is the most efficient way to get there. Take the B or the C train to the 81st St./American museum of Natural History station. Beginning at 9:30 a.m. Wednesday, November 23rd, 81st Street and 77th Street from Central Park West to Columbus Avenue will be closed to vehicular traffic. The balloon inflation can be viewed by pedestrians from 3 p.m. until 10 p.m. on 81st Street and 77th Street from Central Park West to Columbus Avenue. Pedestrians are advised to enter the viewing area from the West side of Columbus Avenue at 79th Street. After 10 p.m., 81st Street and 77th Street from Central Park West to Columbus Avenue as well as Central Park West from 59th Street to 86th Street will be closed to all traffic. The 2016 Macy's Thanksgiving Day Parade will hit the streets from 9 a.m. to noon on Thursday, Nov. 24. More than 8,000 participants are expected to stroll through Herald Square, with over 50 million viewers watching from the streets or at home with family.